While I was working through my Epiphone Matthias Jabs’ explorer project with Lee at GMW, I started to talk to him about another explorer idea that I’ve had using either a Jackson or Charvel neck. Lee told me he had a template for an explorer body and could cut the body and route it for either a 22 or 24 fret neck and whatever bridge type I wanted. So after looking around for a while, I found a neck, neck plate and tuners from a Charvel model 4 and shipped them out to GMW so Lee could build a guitar around them. When he was ready to route the body, Lee asked if I wanted to use a standard Gibson explorer shape or the Jackson/Charvel explorer. 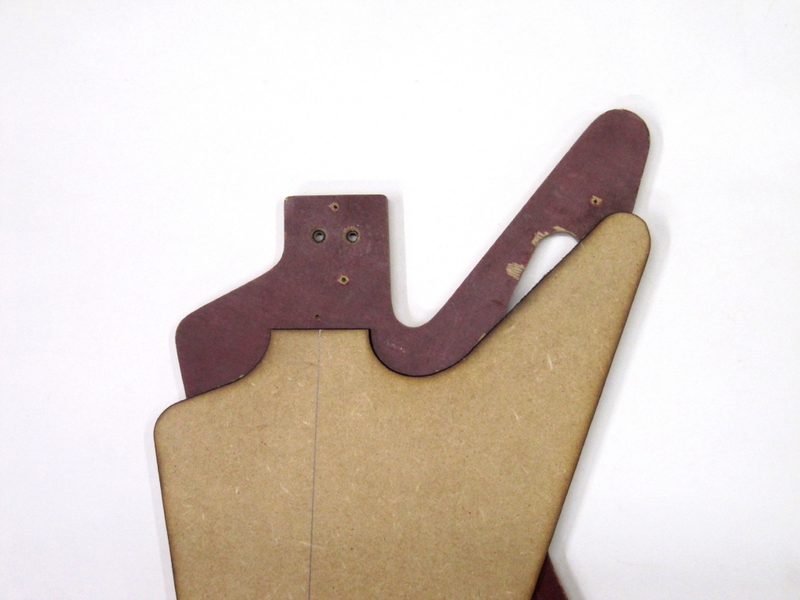 Turns out that Lee has copies of both body shape templates. He told me that they are identical in size on the exterior shape and the main difference is the lower horn has a deeper cut on the Jackson/Charvel to allow for better fret access. So I looked through my pictures library and found a bunch of J/C explorers. Sure enough they had the deeper cut, which I hadn’t noticed before. So I decided to run with the J/C explorer body. Here’s a pic of the 2 explorer templates that Lee sent me with the J/C one on the bottom. And here’s a couple pics of some Jackson and Charvel explorers in case you wanted to see this lower horn, including the recent Jackson explorers at NAMM. My guitar body has already been cut, sealed and painted. It should be finished up in the next 2-3 weeks and I’ll post up some pics of that project. But I just wanted to pass along this info on the J/C explorer body and Lee’s template in case anyone else had some interest in doing an explorer, especially since there seemed like a lot of positive comments about the Jackson explorer that was shown at NAMM this year. 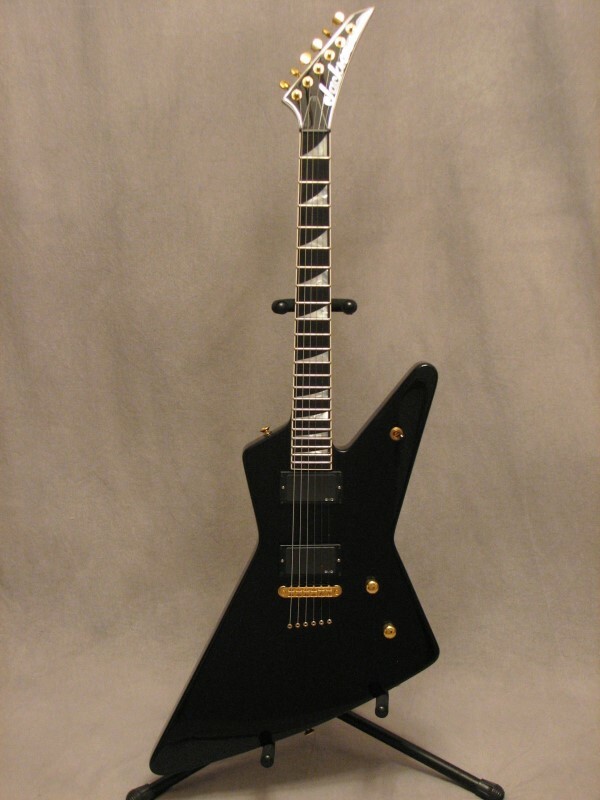 Oh dang, I want a Jackson Explorer bad!! 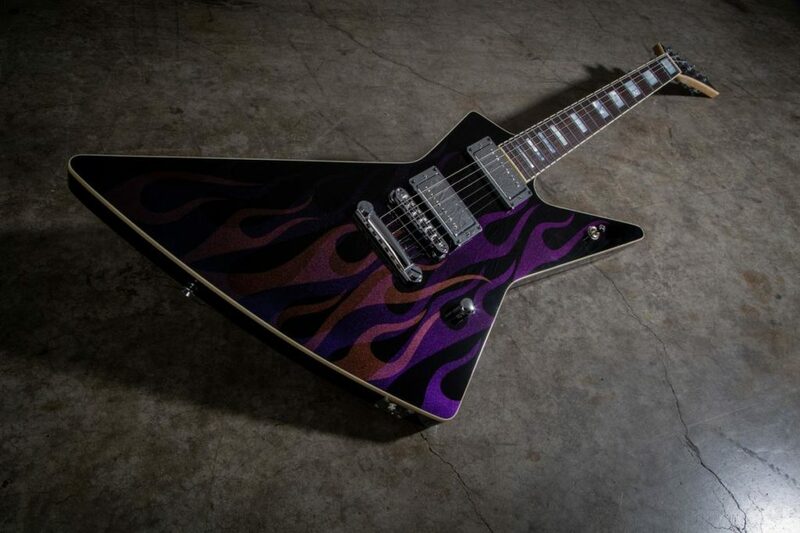 If Jackson does an Explorer Custom Select, I`m getting one for sure. Never knew that about the Jackson Explorer! Now that you point it out, I can't unsee it! Didn't get to comment in your Jabsplorer thread but that was an awesome guitar. I had an 84 Charvel Explorer, and always found it uncomfortable to play the high frets. Not enough room for my hands by the 16 fret up. I don't know if the Charvel was based on the Gibson, and the Jackson was refined. I had an Ibanez Destroyer back in the early 80s, traded it for a Gibson Flying V which I still have and love to bits but wish I still had the Destroyer. I would love a Jackson Explorer, especially after seeing Adrian Smith of Maiden with one on a recent tour (Book of Souls?). Can't wait to see your pics, I could be up for ordering a body - I'm in the UK but have a mate living in the USA who comes over regularly. Last edited by darrellm; 04-04-2019 at 11:12 AM. I've got a Charvel Fusion neck I picked up for a possible project. This is one of the ideas I've been kicking around. Doing an Explorer body. Partially because it seemed like it would be easier for a beginner to cut from a blank since I wouldn't have to do a belly or arm cut. That and I've slowly just been really beginning to like that shape. I wonder if they also changed the horn/cutaway slightly to avoid a lawsuit.